He lifts the satin drape from an iridium silver Mercedes-Benz E350 CDI BlueEfficiency. Like a savvy marketing man, he leaves the podium and struts the stage, taking the media through the features of the car at the Ballroom of The Taj West End hotel in Bangalore. Wilfried G. Aulbur, the bespectacled managing director and chief executive of Mercedes-Benz India Pvt. Ltd, is, ironically, neither a businessman nor a salesman. He is a physicist. I meet him soon after the media launch at the same hotel. We settle down at the Blue Bar, an outdoor bar nestled amid tropical vegetation and enveloped by a moat. He removes his jacket as we order pints of Kingfisher beer on an unseasonably sultry November afternoon, amid a week of relentless showers. As he sees me turn down a Pilsner glass in favour of the chilled green bottle, he chuckles, removes his red and white striped tie and undoes his top button. I can’t resist asking: Don’t you miss German beer? “No. When I drink German beer in India, it just doesn’t suit me as well as a Kingfisher," says Aulbur, who has lived in India for six years. The 44-year-old’s entire corporate career has been with the German auto maker. He started by implementing information technology (IT) processes in the aerospace division of the group, then moved to head business development and strategy at the Mercedes-Benz research and development (R&D) set-up in Bangalore. He went back to Germany as executive assistant to the head of the Mercedes cars group. In January 2006, he came back to India, taking over as the head of India operations. He first came to this country in 1994, when he got engaged to his Indian girlfriend Rekha Srinivasan, whom he met in Ohio. He returned to India in 2000 to work at the company’s R&D unit in Bangalore. He reminisces about the “old" Bangalore, much like its nostalgic citizens. “It used to be a nice place when we were here. You could get from Defence Colony, where we used to live, to Taj West End in 25-30 minutes. Today, you need a helicopter to make that happen," says Aulbur, laughing. Defence Colony is a posh residential locality in east Bangalore, about 6.5km from the hotel. Aulbur expects Mercedes-Benz India to close 2009 as a year of flat sales. Indian auto market sales dropped with the global financial slowdown as banks increased car loan rates. Since July, car sales have picked up smartly, posting double-digit growth over the comparative period last year. Mercedes-Benz witnessed its highest monthly sales ever in October, with 325 passenger cars, more than double of October 2008. “The worst is over. Next year will be a year of growth," says Aulbur, who speaks extremely clear English, thanks to a US education, but with a distinct German accent. Mercedes-Benz has just launched the more fuel-efficient E350, and he adds mysteriously that the company has “a slew of exciting products" lined up for the Indian market. He promises to bring the entire range of sustainable vehicles, be it electric or hybrid cars, to India once the right-hand drives roll out. In November, the German parent unveiled its first hybrid, Mercedes-Benz S400 hybrid, and is building a bouquet of electric cars. Despite its 38 product variants in India, with prices ranging from Rs24 lakh to more than Rs5 crore, Mercedes-Benz sales were overtaken by German peer Bayerische Motoren Werke AG, better known as BMW, in 2009. Mercedes-Benz had been the market leader in luxury cars since its entry into India in 1994. Has the brand that Indian royalty imported since the 1920s, the brand that helps every upstart seal his position in high society, become a little staid, especially with the younger generation? “BMW had the advantage that they hadn’t been seen before. So they looked new," says Aulbur. But he says Mercedes-Benz is better suited to Indian roads. He likens the recent change in customer preferences to a married man who suddenly fancies a new girlfriend. “It doesn’t mean that your wife is old or unattractive. You only need to spice up your marriage." So brand communication has been spiced up, made “significantly younger than it used to be". In the 15 years that the company has been here, business has grown steadily, encouraging Aulbur to open a plant in Chakan, near Pune, earlier this year. “The plant is built to serve us for the next 5-10 years," he says. The luxury car market forms just 0.06% of the overall Indian market; small cars make up nearly three-fourths of total sales. Hence, for the German car maker, which sells around 1.1 million vehicles globally across at least 250 countries, revenues from India are still small. 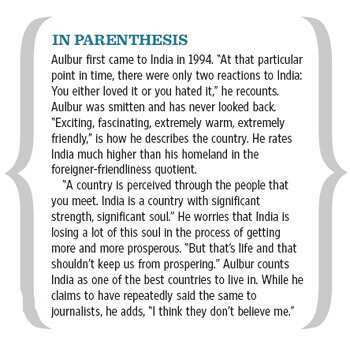 “Growth has to come from markets like India," says Aulbur. Comparatively, “China is a factor 20 or 30 ahead (of the Indian market)". In China, Mercedes-Benz sold at least 53,300 vehicles in the 10 months till October, compared with 2,798 units in India. Aulbur, who is also president of the Indo-German Chamber of Commerce, is counting on a changing India to pump up sales as the young working population begins to earn more and nurture higher aspirations. “The young generation basically wants to enjoy life, they don’t want to save for their children," says Aulbur, who sees the Indian market growing for decades. While Aulbur owns an M-class and an S-class, and alternates between driving himself or using a chauffeur, he swoons over the power-packed AMGs. He says he has used a Merc almost all his life, except for a Chrysler 300C. He now lives in Pune, where the company is headquartered, in a quaint Parsi bungalow in Koregaon Park. Ironically, his wife Rekha, who has a PhD in chemistry and a master’s in business administration, currently works in Mercedes-Benz, Germany. “I’m trying to get her back (to India)." Interestingly, he and his wife, who have no children, have spent nearly half of their 13-year married life living in different cities, most often in different continents. Through these years apart, at least over the last few, Mercedes-Benz has been one of the common bonds between the two.